The particular allure and irony of Fritz Balthaus' early works stemmed from such self-referential mechanisms. 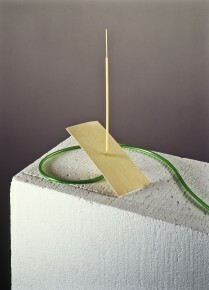 For example the "Junggesellenmakkaroni" ("Bachelor macaroni") from 1987: a mechanically driven Spaghetto, enclosed by a lonely maccharone, rises and falls endlessly. The base of the astonishing apparatus in an angled piece of lasagne. The humor of the senseless and rhythmic agitation of a swaying spaghetto is not endangered by the exposure of the kinetic sculpture's construction: a green air tube and an lapidary aquarium pump are unveiled. The italian pasta's ineffectual rebellion - in itself already symbol of self-referentiality - refers to a further circular model: art as system. Those well-versed in art history will be able list the entire repertoire of possible associations given by the "Junggesellenmakkaroni", especially Marcel Duchamps "Grand Verre" or his "Chocolate Mill" (1914), which works on the principle of spontaneity and with which the bachelor can grate his own chocolate.